A simple yet powerful weather app that combines science with simplicity. A simple yet powerful app that combines science with simplicity for viewing real-time animated weather radar images in vivid color on a highly responsive interactive map. 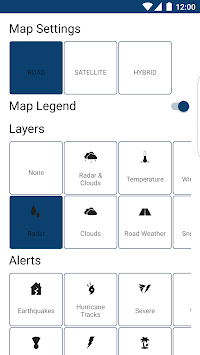 With this major update comes new radar and new weather map options. New hi-definition radar provides stunning precipitation detail. See freezing rain (pink) areas of radar so you know where hazardous road conditions are likely. New Layers on the weather map let you see recent weather activity from the last 6 to 12 hours. 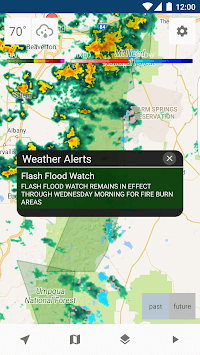 Alerts on the weather map let you see severe weather warning boxes where dangerous weather is happening. • Install and go, no complex setup. • Select opacity of radar images for your preference. • Near real-time, shows the latest radar images within minutes of being gathered. • Sharp radar images even on retina displays that show the latest radar images within minutes. • Get detailed and trustworthy forecasts for all your locations. • Check the current weather and forecast for any point on the map. • Bookmark multiple locations for fast and easy access to your favorite places. 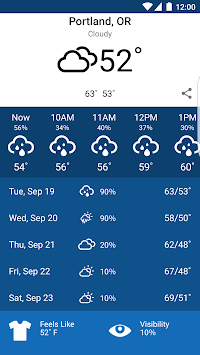 • Current conditions, hourly and five-day forecasts alongside detailed weather information, including pressure readings for all your locations.